He has arrived! If you haven’t received the e-mail introducing our new Property Manager, John Rowland, here you can find that information you’ve been missing! Rowland spent his first 20 years in Boston, Massachusetts and lived in Queens, New York for another 10 years before coming to SW Florida in 2001. John has a background in I.T. and holds a Bachelor’s in Accounting and an MBA from Hodges University. 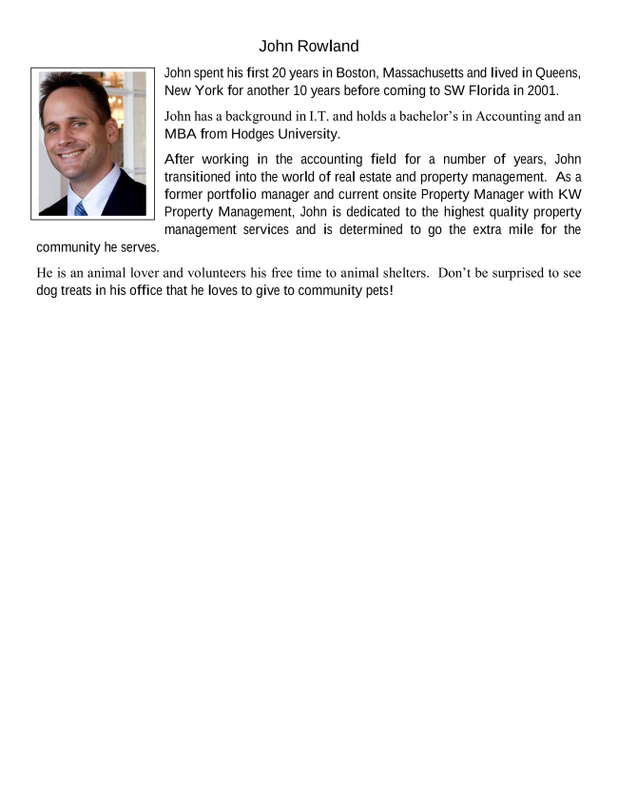 After working in the accounting field for a number of years, John transitioned into the world of real estate and property management. As a former portfolio manager and current onsite Property Manager with KW Property Management, John is dedicated tot he highest quality property management services and is determined to go the extra mile for the community he serves. He is an animal lover and volunteers his free time to animal shelters. Don’t be surprised to see dog treats in his office. He loves give treats to the community pets! Let’s give a warm welcome to our new Property Manager and wish him the best! We all look forward to having John Rowland here in our community.